Why doesn't the Corvette have a De Dion rear end setup?? Is it just too expensive to mass produce or what? Same reason it doesn't have a sleeve valve engine? Actually, with bushing design and geometry improvements and wide flat tire tread, today's performance suspension has very little travel. de Dion still has most of the bad side effects of a beam axle (a one-wheel bump affects the other side) plus most of the bad side effects of IRS (cost, CV joints, lousy anti-squat) and as with a beam axle, you can't control toe in response to fore/aft or lateral forces or bump impacts the way you can with IRS. You can't separate the "compliance" motions (allowing fore/aft wheel motion in response to bump impacts) from the "handling" stiffness very well. A traditional "live" axle can be set up to have a lot of anti-squat on acceleration. Neither IRS nor de Dion can do this, because the differential torque reaction goes right into the chassis without going through the suspension links, so there's no advantage to de Dion in that respect, either. Most newer IRS designs induce toe-in with suspension movement both above or below nominal ride height for better stability and to produce a little bit of roll understeer. The newer IRS designs use a compliant fore/aft bushing to allow bump impacts to be soaked up, but the arrangement of the lower lateral links is such that it doesn't cause the toe to change, and the lateral links have stiff bushings so that the car steers accurately. This is how the better vehicle designs achieve both good handling and good NVH, minimizing the traditional trade-off between them. I will grant that I am NOT familiar with the Corvette's particular IRS; the above statements are certainly true of VW Mk5 Golf/Jetta and of the latest Honda Civic IRS designs ... I owned one of the former, and a customer of mine builds the subframe assembly for the latter. Both of those are more-or-less copies of Ford's "control blade" IRS used on the Focus since its inception. Lots and lots of other vehicles have copied that design because it allows the "ride" and "handling" functions to be separated so well. My own daily-driver right now uses a twist-beam axle (because it's cheap), and on certain bumpy surfaces, if you know what to look for, you can tell where it has ride and handling tradeoffs. Twist-beams are not good at separating the "ride" and "handling" functions, either. Brian P wrote: My own daily-driver right now uses a twist-beam axle (because it's cheap), and on certain bumpy surfaces, if you know what to look for, you can tell where it has ride and handling tradeoffs. Twist-beams are not good at separating the "ride" and "handling" functions, either. 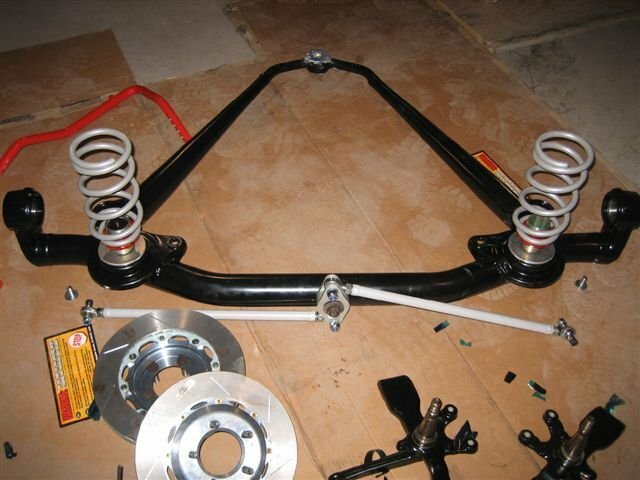 Brian, granted it would require expert fabrication skills, and almost certainly different spring, shock and roll bar if fitted, but for improved ride and handling over back road twisties do you know whether anyone has swapped a MkI Focus or similar IRS into a VW mkII or III? You are fine, please carry-on. I've seen an attempt to make a VW twist-beam rear suspension into an independent design but it basically changed it to semitrailing-arm geometry, which in my mind is a step backward from the twist-beam. For a twist-beam, particularly one designed in the 1970s, VW has them well sorted. I obviously haven't studied what would be involved in your suggestion in detail ... but I'm thinking you would have to hack up the entire back floor of the unibody ... The IRS needs somewhere structural to attach all the lateral arms, which doesn't exist in a Mk1/2/3. A Mk5/6 VW IRS is a complete assembly mounted on a subframe that attaches to the unibody with 4 (big) bolts. All the lateral arms go to that subframe. The trailing links attach to the same spots that the twist-beam attaches on the unibody. A nuisance that you will encounter is that the early VW twist-beams have the spring around the strut (looks like a MacPherson even though it isn't) and the IRS has the springs separate from the strut. It would be a big job! Brian P wrote: I've seen an attempt to make a VW twist-beam rear suspension into an independent design but it basically changed it to semitrailing-arm geometry, which in my mind is a step backward from the twist-beam. For a twist-beam, particularly one designed in the 1970s, VW has them well sorted. There's a lot to "driving dynamics" and whether the rear suspension is IRS or twist-beam is a small piece of the puzzle. A Formula 1 car and a '55 Chevy both have front suspension that can be described as "upper and lower wishbone" but their behaviour is obviously at opposite ends of the spectrum! The calibration matters more than the general arrangement. I've lost count of how many rental cars I've had on business trips. The Ford Fiesta and Focus seem to have among the best steering and the best ride-handling balance among compact cars available at the rental counter. I haven't driven the ST versions but it seems like the Fiesta ST even tops the Focus ST ... and the Fiesta has a twist-beam rear axle! VW seems to build an enormous amount of understeer into their designs. There's roll understeer and compliance understeer and that's on top of "real" understeer from the front losing grip first - helped by being nose-heavy. But on the other hand, their steering is usually pretty good, compared to the usual overly light zero-feedback power steering assistance seen nowadays. The roll understeer is mostly from front end geometry. The compliance understeer is mostly from bushing deflection. Well, it can make some sense in some applications. The Alfa-Romeo Alfetta/GTV6 was probably the most notable car that used it. Here's the overall layout - basically the axle and the two angled trailing arms all pivot as one big unit from where the trailing arms attach to the chassis at the front, and then the watts link locates the whole deal side to side. It makes some sense in this application because that car uses a rear-mounted transaxle and inboard disk brakes, which packages nicely into that big triangle between the long trailing arms and the axle. As for whether it was actually a real benefit over a proper IRS ... one tends to suspect not, since Alfa doesn't use that transaxle and suspension layout any more. The other common one, which was probably built in greater numbers (and still is in production), is the smart fortwo. 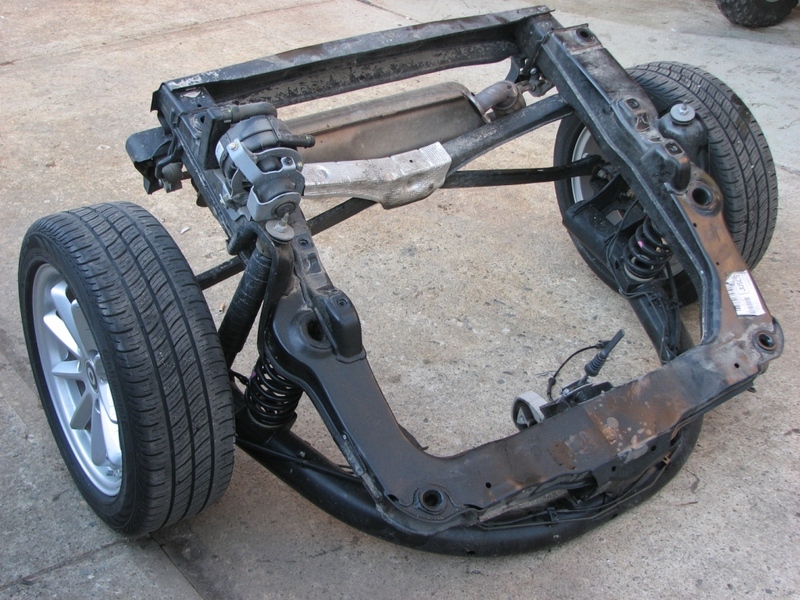 That one has rear suspension that looks like this. The U-shaped axle has a single pivot in the middle at the front, and the lateral arms at the back locate each end. This design binds when away from design ride height because the lateral arms swing in an arc. Presumably this is partially accommodated by bending the arms of the U (into toe-out! - BAD) and probably mostly accommodated by compliant bushings all around. It makes sense in that application because there is an entire transverse engine and gearbox nestled nicely into the space inside the U-shaped axle. That the deDion axle keeps the wheels upright regardless of body roll (something no IRS can do) and allows a higher rear roll center without introducing any "jacking" effect (also not possible with IRS) and thus allows the rear spring rates to be softened and to not need a rear antiroll bar, are all good things in this application. The bad side effects are mostly irrelevant in a city car with no performance aspirations whatsoever. Let me run this by everybody. I have been thinking of using thin sheets of high strength banding material shaped such that that each stacked sheet forms a , "Y", on each end so that the middle of the stack of sheets would be fastened to the rear-end and the out-board ends bolt to the spindles top and bottom stacks here. The two stacks of sheets would serve as a spring as well as for locators so that no sway-bar or watts linkage would be needed. The rear-end pumpkin would be centered in the hole made by the, "Y", and also bolted to the frame like a regular IRS. A sketch would be helpful. It sounds vaguely like the leaf spring will be doubling as part of what locates the spindles. Ferrari built a f1 test car with the pickup points for rear a arms and de deon. Was tested back to back with two drivers. Lap times were nearly identical. Both drivers commented that the de Deon was somehow more predictable. I suspect that the more stable camber was what they were feeling. It was said earlier it has disadvantages of both its and live axle. Constant camber that an irs couldn't or shouldn't have. Wouldn't surprise me. F1 (at least in the modern era) is something of a special case ... due to the nature of the tracks and the nature of the rulebook, they use very high spring rates and the suspension has little compliance. In a similar vein to "you can make any bad suspension design work if you don't let it", it probably doesn't much matter how the hubs connect to the chassis. There's little camber or toe change no matter how the suspension is designed because the suspension hardly moves. Aerodynamics plays into the design of the suspension as much as anything else. In applications where the suspension has to move, de Dion indeed keeps the wheels vertical regardless of body roll as with a beam axle and it does indeed have less unsprung weight than a live axle given that the diff stays with the chassis. 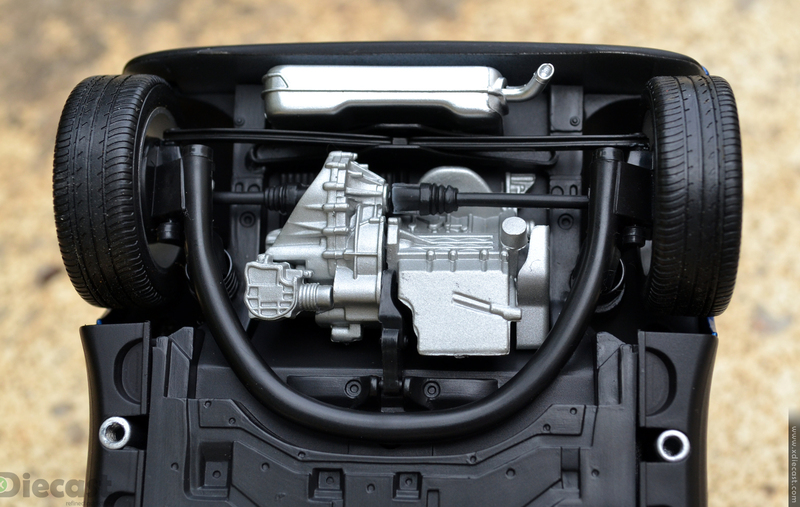 The Alfa inboard-brakes design reduces unsprung weight even more. But I have a suspicion that an upper and lower A-arm design would even further reduce it!